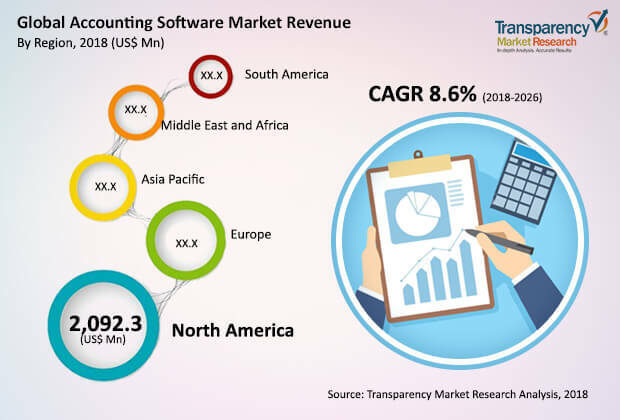 According to a new market report published by Transparency Market Research, the global accounting software market was valued at US$ 5,715.9 Mnin 2017 and is expected to reach US$ 11,771.6 Mn by 2026, expanding at a CAGR of 8.6% from 2018 to 2026. According to the report, North America was a prominent contributor in terms of revenue to the global accounting software market in 2017. This is primarily due to the integration of accounting software with smartphones, tablets, and computers across the region. The global market for accounting software can be segmented based on deployment, software type, application, enterprise size, industry, and geographic regions. In terms of deployment, the market can be classified into Software as a Service (SaaS), on-premise, and hybrid. The Software as a Service (SaaS) segment is anticipated to hold a prominent share of the accounting software market, in terms of revenue, by the end of 2018. Based on software type, the market can be divided into commercial off-the-shelf, enterprise accounting software, custom accounting software, reconciliation, and tax management. The enterprise accounting software segment is projected to hold a notable share of the market by the end of 2018. However, the tax management segment is estimated to expand at a significant pace during the forecast period. Furthermore, based on application, the global accounting software market can be categorized into payroll management systems, billing & invoice system, enterprise resource planning systems, time & expense management systems, and others. The time & expense management systems segment is expected to expand at a significant growth rate in the near future. In terms of enterprise size, the market can be classified into small and medium, and large enterprise. The large enterprise segment is likely to account for a major share of the market during the forecast period due to the fact that large enterprises prefer accounting software as compared to the traditional accounting methods, as it saves time and accounting can be performed easily with less manpower. Based on industry, the accounting software market can be split into banking, financial services, and insurance; telecom and information & technology (IT); manufacturing, construction, wholesale distribution, non-profit organizations, chemicals, food and beverage, and others. The banking, financial services, and insurance segment is expected to hold a considerable share of the market during the forecast period. In terms of geography, the global accounting software market can be segmented into North America, Asia Pacific, Europe, South America, and Middle East & Africa. Among the regions, North America is expected to dominate the global accounting software market during the forecast period. However, Asia Pacific and Europe are also expected to account for significant market share during the forecast period.